Nah. Actually Dat Kush stage is what made me want to learn how to do that. But I still haven't been able to apply it to your stage. I'm gonna try again soon. Yo it's pretty cool stage, for real. Intro is real cool, so is the way you made the floor move. The fact that it's moving with some nice deltas is intriguing too. The only thing that irks me about it is the character placement, you should try putting them a tad lower IMO, for bigger chars it looks kinda wonky. 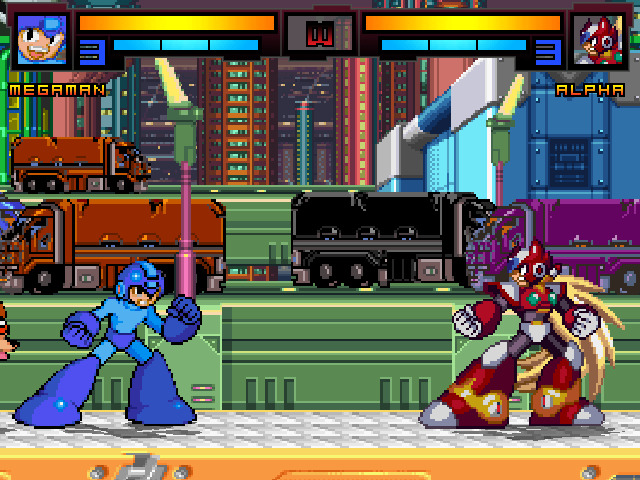 Other than that and a few of the trucks colors being a bit clashy, but the idea itself was really creative, and like 1 or 2 (which don't even matter) uncropped sprites everything seems great. Imma keep this, really cool old school feel, nice environment and deltas, it'd be cool to see you venture into custom HR Stuff. Thanks a lot LilBro. I've been thinking about doing more custom HiRes. But I'm not quite ready yet. I've got so many other ideas floating in my head. I seriously was gonna change my MO once but I got inspiration elsewhere. The fact that you feeling it lets me know I did Aight. The zoffset does seem a bit high and I went a little wild on the truck colors. I may adjust that offst but i purposly wanted contrasting colors. I guess cuz i feel like a lot of times things in the world just don't match. Ya feel me? Thanks again for the advice, tho. The zoffset does seem a bit high and I went a little wild on the truck colors. I may adjust that offst but i purposly wanted contrasting colors. I guess cuz i feel like a lot of times things in the world just don't match. Ya feel me? No prob, I feel you. Not a legit issue, totally preference so I totally understand if it was intentional. Thanks for the advice, tho.